Church Architecture Conference at Mundelein! Gregorian Chant Mass on Notre Dame Campus! Is a New Style of Architecture Possible? 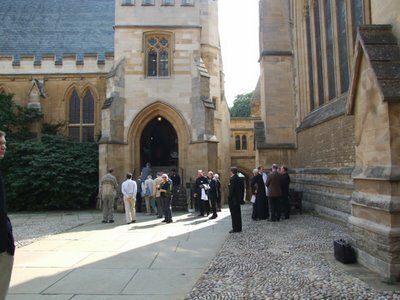 [The following is part one of two or three parts on the CIEL 2006 Colloquium hosted at Merton College, Oxford University this past September 13th-16th. Part one will focus upon the Colloquium experience from a liturgical and social perspective. Part two will focus upon the papers delivered at the Colloquium. Please note, a more formal report will be created out of these pieces, but for the purposes of the NLM, some personal anecdotal information is included here that will not be included there. In the English speaking world, one can ask for little better venue for an academic colloquium than storied Oxford University. Without question it is one of the world's most famous academic institutions, with an unquestioned international reputation for scholarship and academic excellence. Further to this setting is Merton College, one of the oldest colleges at Oxford, reaching back to the 1200's, founded by Catholic bishop, Walter de Merton. 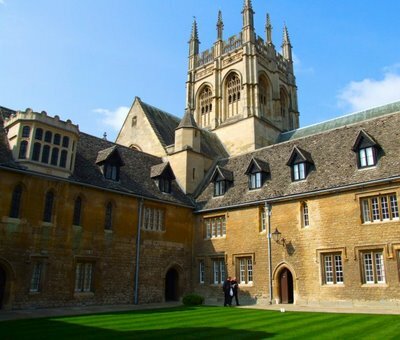 While Oxford is no longer a Catholic institution, nonetheless its Catholic roots and foundations are still quite evident as one walks its cobbled courtyards, visits its chapels and is looked upon by countless saints in their architectural niches. This foundation became a little clearer for 4 days as the Centre International d'Etudes Liturgiques “took over” (in the friendliest manner possible, and with great assistance and cordiality from its chaplain) Merton College, and hosted some of the brightest Catholic liturgical minds of our day, surrounded as well by classical liturgy of the highest calibre. A view of Merton College's Tower from the "Mob Quad". This was the lovely view which I was treated to from my own room. As the delegates began arriving for the colloquium on a beautiful late summer day, it did not take long before informal visiting began in the front quadrangle of Merton College, overshadowed by the glorious central stained-glass window of the chapel. As the bells tolled the quarter-hours, various laymen and women, as well as cassocked priests and religious in their habits became more and more numerous – so too did the languages being spoken. In such moments does the international character and appeal of CIEL become most evident. After registering, there were a couple of hours available to us. A few of us, including Fr. Neil Roy of the Research Institute for Catholic Liturgy and editor of the liturgical journal Antiphon, determined to take advantage of this time to stroll about the University. Within just a few short minutes walk, we were able to see such sites as the Bodleian library and Newman's Oxford-Movement church of St. Mary the Virgin and the pulpit from which he delivered so many sermons, including most of his Parochial and Plain Sermons. Turning each corner, one was met with yet another spectacular view of Oxford's mediaeval gothic architecture. During Newman's time in the Oxford Movement in the Oxford Church of St. Mary the Virgin, this is the pulpit he preached from. 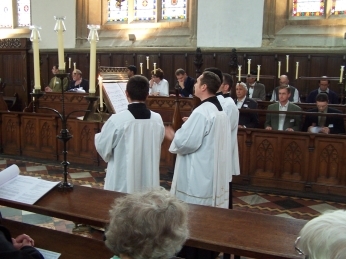 The conference began in the relaxed atmosphere of the quadrangle and moved into the solemnity of Vespers. 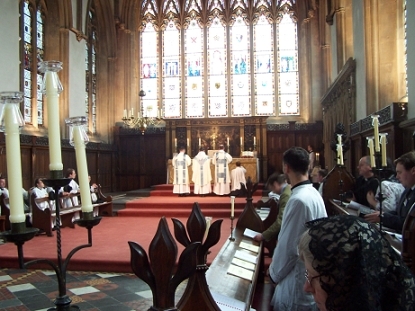 Merton's chapel is organized with traditional antiphonal seating, and its brass lectern served well for the schola which sung at each of the liturgical services. 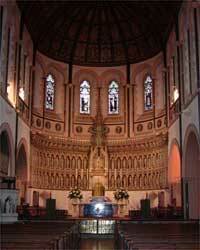 The setting was indeed very mediaeval, very monastic and very much in a Catholic spirit and origin. 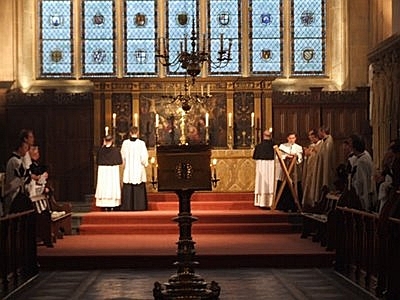 As such, it provided a most fitting environment for the celebration of the classical Roman liturgical offices and Mass alike. One indeed had a sense of reclaiming this chapel to the divine worship of the Catholic Church which had characterized its daily services for centuries and for which it had been built. Each day of the colloquium was slated with the primary liturgical offices of Lauds, Vespers and Compline. As some have commented, this moved the CIEL colloquium into the domain of not simply an academic liturgical colloquium, but also that of a liturgical retreat. Kudos must be given to the colloquium organizers whom saw fit to introduce this level of liturgical life into the colloquium. In so doing, it continually put forward the tangible reality for which CIEL exists, and upon which the colloquium was based: the sacred liturgy. 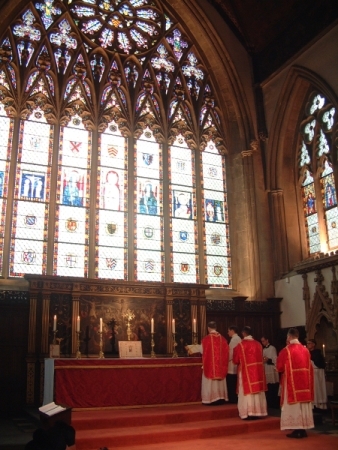 In addition to these offices, each day was also characterized by the celebration of the Solemn High Mass. 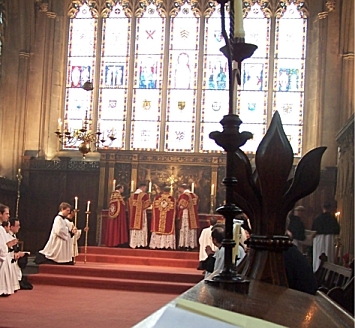 All of these liturgies where celebrated with due solemnity and excellence – and it should be noted, with the eager and quite vocal contributions of the gathered clergy and laity. 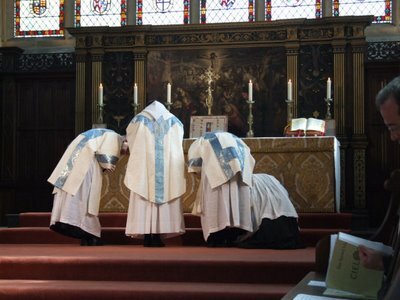 From the splendid sacred vesture, the excellent schola and glorious organ, to the reverent care of the sacred ministers in the sanctuary. Surrounded by the imposing, original mediaeval stained glass windows of the chapel, one indeed could only walk away with a sense of “cosmic liturgy” -- of the tangible reality of the earthly liturgy as an icon of the heavenly liturgy – not to mention the value and worth of that which brought us there: the treasure that is the Roman liturgical inheritance. Lauds and Vespers were often celebrated in their solemn form. In addition, the office of Compline was sung to candlelight each evening using the candles which adorned the chapel's antiphonal pews. Needless to say, chanting the Nunc Dimittis and Salve Regina in such circumstances was nothing short of moving and a profound experience of prayer. As for the Mass, the colloquium was blessed to have two important feast days which to celebrate: the Feast of the Exaltation of the Holy Cross and the Feast of the Seven Sorrows of the Blessed Virgin Mary. 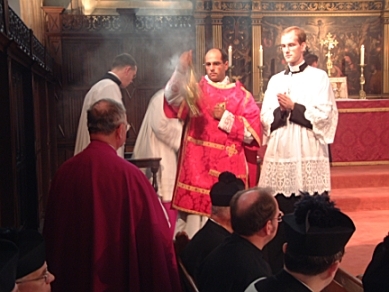 The first Solemn High Mass celebrated on the Exaltation of the Cross was celebrated by Fr. 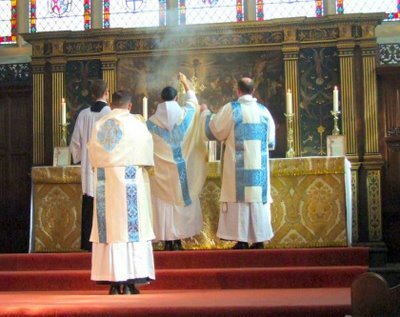 John Emerson, FSSP and the homily preached by Fr. Armand de Malleray, Secretary General of the FSSP. On the Friday of the Seven Sorrows of the Blessed Virgin, Mass was celebrated by Dom Daniel Augustine Oppenheimer, the prior of the Canons Regular of the New Jerusalem. 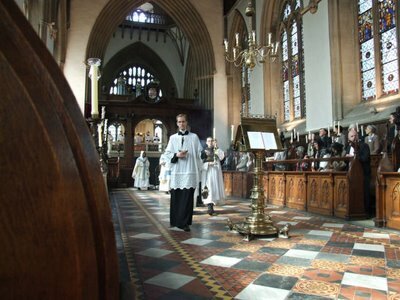 This liturgy was particularly monastic in feel and certainly brought back echoes of Catholic Oxford of past and what must have been a regular sight at one time. The final Mass of the colloquium was a Solemn High Pontifical Mass celebrated by His Excellency, Bishop David McGough. I was privileged to attend the Bishop as his Mitre-bearer during this Mass. Many will be pleased to know that a video recording was made of much of this solemn liturgy, thus making available some of the sights and sounds of the 11th International colloquium in a more tangible way. 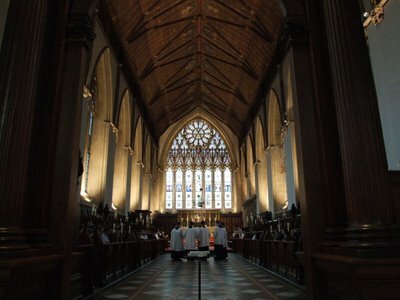 Besides these official CIEL masses, I was also blessed to have the opportunity to go to the Oxford Oratory early each morning where priests where celebrating their private Masses – for Father Thomas Kocik had asked if I might serve his own Mass. I was only too happy to oblige of course. 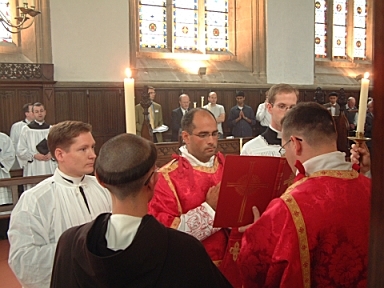 Further to that, it was also a moment wherein one could witness the growing communion of the classical liturgical movement and the reform of the reform, for while the majority of the masses were said in accordance with the 1962 Missal, there were also Masses said in accordance with the 1970 Missal, in Latin and, of course, ad orientem. This sight was a testimony to the breadth of relevance of CIEL's work. Before moving on to a discussion of the academic work which brought together the colloquium, it would be well to speak about another important aspect of a CIEL colloquium: visiting and time for discussion. 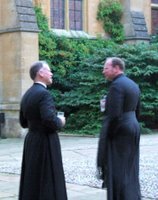 Between papers and liturgies there was time in the dining hall of Merton, during the evening reception, or in the walks between venues for such. The college dining hall in particular became a central point for conversation, friendly debate and conviviality generally. Besides the splendid atmosphere of a Tudor style hall, surrounded by dark wood, heraldry and large oil paintings of College founders and figures, there was splendid company and splendid food, wine, cheeses, and even the appearance of a particularly fine Port, which couldn't but help this along. Just a small few of the over 160 delegates that attended the Colloquium gathering in the front quadrangle beside the great window of the Chapel and directly in front of the dining hall. Fr. Thomas Kocik, author of Reform of the Reform? 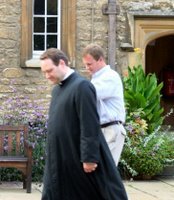 A Liturgical Debate and Brian Mershon of The Wanderer strolling through one of the many courtyard's of Merton College. Fr. John Emerson, FSSP, and Fr. Joseph Santos speak in the front quadrangle. In many cases there were opportunities for sharing information and ideas, exchanging contact information, or delving deeper into the topics at hand. In other cases, it was just a time to meet new people from different countries, or put faces to names that one might have heard of before and thus to further cement friendships. All of these things have their own value in the building up of this new liturgical movement and which extend the fruits of the colloquium long after it has finished. Part II of the CIEL Colloquuim Report will focus on the papers given at the conference.